We’ve compiled a list of some of the most frequently asked questions so you can access important information quickly and efficiently. If you have additional questions, contact us with your concerns. We're happy to help! What are Queen Creek Elementary's school hours? What should I do if my child must miss a day of school? Does the school offer cafeteria lunches? If so, what is the cost? May I eat lunch with my child at school? May I visit my child's classroom? Do students have access to a computer lab at Queen Creek Elementary School? Do you offer extra learning opportunities for gifted students? Do you provide services for students with special education needs? What is the procedure if my child must take medication during school hours? Does Queen Creek Elementary School have a dress code? Is bus transportation available to Queen Creek students? Teacher Work Day: 7:30 a.m.–3:30 p.m.
Grades K–4: 8:10 a.m.–2:45 p.m.
Preschool Little Coyotes: Times vary; please check with your child’s teacher. For the safety of our students, we do not permit students on campus until 7:45 a.m. when adult supervision is available. Parents must telephone the school office to excuse any child who is absent from school. Please call our office (480) 987.5926 by 10:00 a.m. to inform us of the reason for the absence. If we are unable for account for a student, we will notify parents by phone. It is essential that students attend school regularly in order to provide continuity in the learning program and to enhance the probability of success in school. Please avoid absences for reasons other than illness or emergency situations. Please schedule doctor appointments, dentist appointments, and vacations during times when school is not in session. Yes we do. For current meal prices, please view our Child Nutrition page where you can find prices, menus, nutritional information, and more. We also offer items a la carte. You may make payment for lunches daily or weekly. Our school cafeteria staff is happy to answer any questions about your child’s account. Feel free to call us at (480) 987.5924. We welcome parents to eat lunch with their child. Please check in at the main office before entering campus. Kindergarten: 11:00–11:20 a.m. | Recess 11:20–11:40 a.m.
1st grade: 11:10–11:30 a.m. | Recess 11:30–11:50 a.m.
2nd grade: 11:25–11:45 a.m. | Recess 11:45–12:05 p.m.
3rd grade: 11:45–12:05 p.m. | Recess 12:05–12:25 p.m.
4th grade: 11:55–12:15 p.m. | Recess 12:15–12:35 p.m.
We welcome parents to come and observe their child and to volunteer in the classroom. Please make an appointment with the teacher and the administration first to avoid conflicts such as testing, workshops, conferences, early releases, assemblies, or classroom specials. We require all visitors to our campus to sign in at the front office and wear a visitor ID badge. Sign in at the front office before proceeding to your assigned areas. We require every visitor/volunteer to wear a visitor ID while on campus. We do not allow volunteers to laminate. We do not allow volunteers to bring siblings or children with them. Before leaving, please sign out at the front office, and return the visitor’s pass. We provide every student the opportunity to learn and use computer technology during a scheduled weekly computer time. Please review our "use of technology agreement" provided in the packet at the beginning of each school year. We require both parents and students to review and sign the agreement. Queen Creek Unified School District provides an Enhanced Learning Program (ELP) for students in grades 2–5. Students in grades K–1 receive enrichment activities in the regular classroom. The ELP program is a pullout program where students work with the ELP teacher for two to four hours per week, depending on grade level. 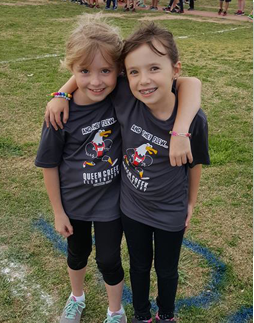 Queen Creek District provides a variety of special education programs and services for all identified students between the ages of three and 22. In keeping with state and federal mandates, district personnel, together with the student's parents, determine the type of special education program that best meets each student’s individual educational needs. Our goal is to serve our students in the least restrictive setting possible. Visit our district website for more information about the QCUSD Special Education program. If your child must take medication during the school day, we require a signed consent form on file. You may pick up a form from our health office. We will not dispense expired medication. We permit only medication that a student must receive during school hours, including cough drops and pain relievers. An adult must bring medication in person—NO child may transport medication to or from school. We keep all medication in a locked cabinet and dispense it through the nurse or by a responsible adult staff member. We may provide students a change of clothing in the health office if needed. For the safety of our students, we require students to wear tennis shoes on PE days. If you must take your child from school before the normal dismissal time, please send a note with your child including the time and reason the student will be leaving. Students will remain in the classroom until the office staff notifies the teacher. A parent/authorized person must report to the office to sign the student out. If transportation needs change, we require a phone call from the parent/guardian before 2:00 p.m. as the last few minutes of the school day can be very hectic. Yes, we provide the privilege of bus transportation. For a safe and enjoyable ride to and from school, please remind your children frequently about the rules for good behavior on the bus. We do NOT allow students to ride a bus other than their assigned bus route or to get on or off at a different house unless we receive a written request from the parent/guardian that is signed by the principal/office staff. Parents/guardians may also make arrangements by calling the office. View our district Transportation page for more details.